Randy and I moved to London in the summer of 2003. If you are European, you probably remember that summer because it was the one with the unbelievable heat wave. Temperatures soared in normally very mild (read: cold) London and got so high in France that hundreds of people died. For over a week, temperatures in jolly old England were close to 100 degrees (that would be 33 Celcius) and we were all miserable. When we get high temps in Seattle each summer (for three or four days), people go crazy because no one has air conditioning. But, to be fair, all the shopping malls, movie theatres, museums, and many restaurants do. There are places where you can go to be cool. And, of course, Seattle is surrounded by water. There are many places to just go, well, jump in a lake (or the Sound). London? Not so much. First of all, no one in their right mind would jump in the Thames. And, at least when we were there, every place we thought would be cool was not. And believe me when I tell you that we tried a variety of options. On the fifth or sixth day of the heat wave, we decided to head out of the city to try and find some cool. I’m not sure why we thought taking the Tube was a good idea but there we were, with my brother Michael in tow, heading to Hampton Court, trying not to move a muscle, trying not to stick to the seat. We went to a movie and sweated. We ate lunch and sweated. We sweated even more on the way home. Just blinking my eyes made me hot. I remember a lot about that day – I even remember the movie we saw (Pirates of the Caribbean – come on, we were desperate.) For people who love to eat, many memories are associated with food. That day sticks out so clearly for me because it was the first time I tasted Haloumi. Ha-what? you may ask. Haloumi is a cheese originating from Cyprus that is, in my experience, totally unique. It is extremely dense and holds its shape when you cook it. Raw, it’s a bit intense. Squeaky is not usually an adjective I like to use in describing a cheese I am eating. Cooked, it mellows a bit – softens, gets less squeaky. It is quite salty, but for savory loving people like me, that is a compliment. That hot hot day, the cheese was in a salad and it really blew my mind. It is such a treat to be a food person and to eat something completely new and different. Since then, I have tried numerous recipes using it and this is my favorite. For this appetizer, you grill both the haloumi and lemon slices. The taste combination with the dill-intense dressing is so unique that everyone I have ever served it to goes crazy for it. If you have a non-stick grill pan, that is a great thing to use for the cheese. I gave that pan away and used the grill on my stove and made a mess. Totally worth it though. UPDATE: I’ve had a few questions about whether or not you eat the lemon rind. You do! The lemon is sliced very thinly and being tossed in the marinade and then grilled, it becomes very soft. Its intense citrus flavor is most welcome against the saltiness of the cheese. Haloumi can be a bit hard to find, but they always have it at my Whole Foods. I would recommend using a nice dense bread (like a pain de campagne) and cut multiple slices – I’ve done as many as 8 depending on the size of the bread. Prepare a gas grill (or a grill pan) over moderately high heat. Cut 8 thin slices from the lemons, then squeeze enough juice from remainder to measure 2 tablespoons and put it in a bowl. Halve cheese diagonally, then cut each triangle, cut side down, into 1/3-inch thick slices. Mince garlic and mash to a paste with a pinch of salt using the side of a large heavy knife, then add to lemon juice. Whisk in salt and s sugar until dissolved, then add ¼ cup oil, whisking until combined. Separately toss lemon slices ad cheese each with ½ tablespoon dressing. Brush both sides of bread with remaining 2 tablespoons of oil. Grill bread, cheese, and lemon slices on grill rack (or in pan), covered, turning once (use a metal spatula to scrape under cheese) until bread is toasted (2 to 3 minutes), grill marks appear on cheese (3 to 4 minutes total), and lemons begin to wilt (4 to 6 minutes total). Whisk dill into remaining dressing. 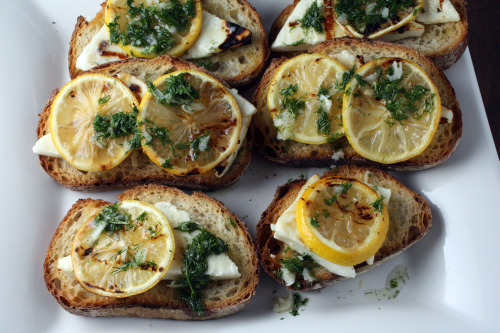 Divide cheese and lemon slices between bread and drizzle with dressing. Serve immediately. Okay… this may be a very dumb question, but do you eat the lemon rind? I love haloumi cheese , very hard to find at a reasonable price in Chicago . I eat it as a salad : grilled haloumi ,sweet watermelon , fresh mint leaves ( torn ) and a handful of arugula and a tangy lemon and oil dressing !!!! to die for – you could also add some homemade croutons for substance !!! This appetiser looks delicious and very easy to whip up ! This is awesome! I had haloumi cheese a few times, love it – I am a salt-addict anyway. I am also a bit curious about eating or not the lemon rind. I don’t mind citrus rinds. I love this cheese too. I can’t wait to make this one. Great recipe Dana! Oh my goodness, this is my idea of heaven! I love halloumi (always have some at the ready in the fridge), love lemon and dill, but it never occurred to me to combine them. Fabulous! Oh, this sounds so good! I can almost taste it in my mouth the way you described it. I’ve never had haloumi cheese, but you’ve peeked my interest. Love your story made me laugh, I know exactly what you mean about those hot, sweaty days! i’ve wanted to try haloumi ever since hearing nigella lawson talk about it. this looks so tasty, i’m going to have to hunt it down! I hadn’t heard of halloumi cheese until I stumbled upon an online recipe for grilled halloumi. I was so intrigued that I went ahead and made a grilled cheese using halloumi, portobella mushrooms and red onions. It was an interesting sandwich that I only somewhat liked. My favorite part was the cheese though. The fact that it doesn’t really melt at high temperatures is awesome. Ahh, I remember having haloumi when I studied in Jordan. It’s such a great snack when I get a strong craving for salty foods. I’ve found that a lot of cheese in the Middle East resembles it, it melts better but still has that salty bite. It’s really great! What a wonderful recipe and tempting pics! I love haloumi cheese and actually I have some in the fridge right now, hahah. Things must have changed because now everywhere in London has air conditioning (except houses). My word, a movie theatre without air conditioning?!?! I’m glad it’s not 2003! But yeah… there is NOWHERE worse than the Tube during a heatwave. It would be cooler in hell. Oh, London! I grew up nearby, and used to live there. One of the (many) things I miss most about London is the relatively cheap Halloumi Cheese. It is so expensive in the states!!! I have found that “frying cheese” is similar to halloumi, though without the saltiness. My favourite thing ever is mixed salad greens with olive oil and lemon and halloumi, but eating it with grilled lemon sounds incredible!!!! Have you ever had the veggie burgers at Borough Market, with halloumi inside of it?? Heaven. Oh I must make this!! I can imagine the combination of Haloumi, lemon and dill to be just outstanding. Yum! Looks gorgeous too.